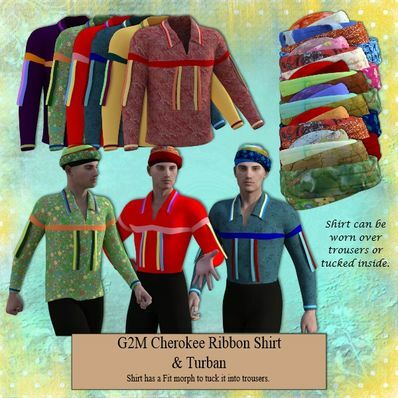 Cherokee Ribbon Shirt & Turban for Genesis 2 Male for use in Daz Studio 4.6. Morph in shirt to tuck into trousers. Thank you so much! This is the first time I've ever found one of these. Much appreciated! Nice work! Thank you so much! Thanks Wendy for this versatile usage shirt for the guys. Thank you very much for this beautiful set! Both pieces are so nice!